TLD Design Center & Gallery. A Chicago Area creative art/education center/School with a contemporary mixed media art gallery in Westmont, IL which is a suburb of Chicago. 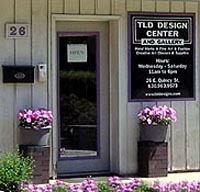 TLD Design Center & Gallery (TLD Designs) is a creative art education, art supply and Art Gallery facility located in the close Chicago suburb of Westmont, (IL) Illinois. Tammy L Deck is the resident artist and owner whose formal education and professional interest is in the area of clothing, textile science and fiber art a/k/a fashion design and wearable art. TLD Designs' facility is geared towards creative art classes for children and adults....but we also house an intimate gallery where we host invitational art exhibits and a year around offering of the fine art and artwear of our resident artist, Tammy L Deck together with the beadwork, glass beads and other work from the hands of our instructors. 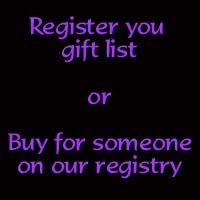 We offer well over 300 different art classes and retail the specialty supplies to support our classes...such as yarn, glass, beads, looms, knitting machines and needles, wool, silk fabric and so much more.. This section is all about what TLD Designs has available and will repeat so that web search engines can find us quick and easy for you. Feel free to read this if you like...we're not trying to hide anything... mislead you....or bore you. TLD Designs caters to a broad spectrum of interests and include a range of creative art media topics such as: weaving classes (on the economical ridged heddle loom a/k/a knitters loom, four harness (4 shaft) table looms...and/or 4 shaft and 8 shaft floor looms), we also sell the looms (new and used), yarn, equipment and supplies for weaving. 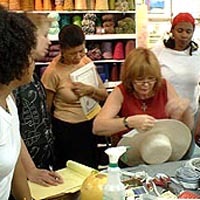 We offer knitting machine lessons and instruction and sell yarn on cones for convenience. TLD Designs' offering includes Glass Bead Making a/k/a lampworking or flame work techniques...for the rank beginner through advanced sculptural and miniature blown glass forms. We sell soft glass rods, tools and other supplies to support our student's glass working interests. Knitting, crocheting and felt making (nuno style and other wet felting) are other specialty classes and we carry the felting needles, merino and other wool fibers to support your felting and felt making needs. Jewelry design is another passion of ours and we cater to the beginner student in the creation of had wrought sterling silver jewelry design/making classes. Silver metal clay and pmc (precious metal clay) skills are taught year around. We also teach beginner level classes in sewing for fiber art and fashion design and guide you through more advanced professional skills that include fashion design and pattern making skills with an emphasis in draping design and flat pattern combinations. 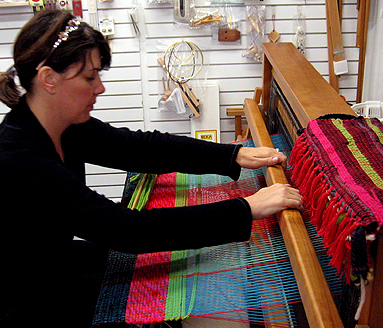 Other specialty fiber art classes include kumihimo japanese braiding, triaxial weaving, inkle weaving for belts, bands and trims. Wool fiber for spinning, weaving and felt making. 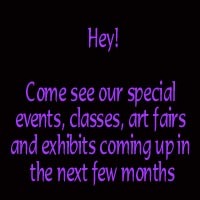 Here's where the keywords are gonna repeat: Illinois Suburban Chicago Area of Westmont, Glass Bead making Classes and beading supplies, glass bead lampwork and flamework skills including glass and supplies. Wool for felt making and felting needles and fiber and merinos wool. Classes, workshops, summer camps for kids. weaving, knitting, spinning, crochet, kids and tweens and teens classes and workshops. yarn for knitting, weaving spinning and all other fiber art interests. lampworking / flame work glass bead making classes and workshops, felting, felt making nuno style scarves. Summer and holiday fiber art, jewelry art, polymer clay camps for kids and adults. We teach students to be designers and artists so all work is one of a kind. Glass for fusing and glass bead making (lampworking) in stock. Fine art and fashion instruction and education. kids and adult classes and workshops. yarn, knitting machines, weaving looms new and used. 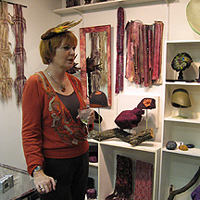 TLD Designs' owner, Tammy L Deck, is an award winning professional, exhibiting, fiber (artwear) artist and member of the Illinois artisan program. Illinois Suburban Chicago Area of Westmont, Illinois Suburban Chicago Area of Westmont, Illinois Suburban Chicago Area of Westmont, Illinois Suburban Chicago Area of Westmont, Illinois Suburban Chicago Area of Westmont, Illinois Suburban Chicago Area of Westmont, Illinois weaving, knitting, spinning, crochet, kids and tweens and teens classes and workshops. yarn for knitting, weaving spinning and all other fiber art interests. 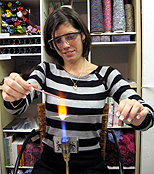 lampworking / flame work glass bead making classes and workshops, felting, felt making nuno style scarves. Summer and holiday fiber art, jewelry art, polymer clay camps for kids and adults. We teach students to be designers and artists so all work is one of a kind. Glass for fusing and glass bead making (lampworking) in stock. TLD Designs caters to a broad spectrum of interests and include a range of creative art media topics such as: weaving classes (on the economical ridged heddle loom a/k/a knitters loom, four harness (4 shaft) table looms...and/or 4 shaft and 8 shaft floor looms), we also sell the looms (new and used), yarn, equipment and supplies for weaving. We offer knitting machine lessons and instruction and sell yarn on cones for convenience. 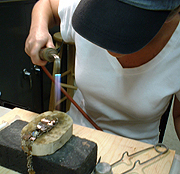 TLD Designs' offering includes Glass Bead Making a/k/a lampworking or flame work techniques...for the rank beginner through advanced sculptural and miniature blown glass forms. We sell soft glass rods, tools and other supplies to support our student's glass working interests. Knitting, crocheting and felt making (nuno style and other wet felting) are other specialty classes and we carry the felting needles, merino and other wool fibers to support your felting and felt making needs. Jewelry design is another passion of ours and we cater to the beginner student in the creation of had wrought sterling silver jewelry design/making classes. Silver metal clay and pmc (precious metal clay) skills are taught year around. We also teach beginner level classes in sewing for fiber art and fashion design and guide you through more advanced professional skills that include fashion design and pattern making skills with an emphasis in draping design and flat pattern combinations. Other specialty fiber art classes include kumihimo japanese braiding, triaxial weaving, inkle weaving for belts, bands and trims. Wool fiber for spinning, weaving and felt making.